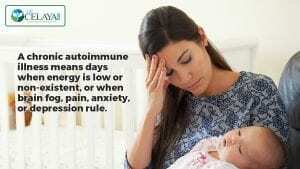 Are you a mother with autoimmune disease and low energy? A chronic autoimmune illness means days when energy is low or non-existent, or when brain fog, pain, anxiety, or depression rule. Regular life may include long treks to other cities or states to see a doctor who understands your condition, but it doesn’t have to. Dr. Celaya can help and can see you by phone or skype. Click here for a FREE 15 minute consultation. Your diet is restricted and the house is void of junk food and sodas. Weekends may be devoted to batch cooking meals for the week and your autoimmune disease may require you to delegate chores to your kids. But none of this has to stand in the way of loving your kids and it may even make them better people. If you want to know more about your health, click here for a FREE 15 minute consultation to see if Dr. Celaya can help you.